The Icebound Land John Flanagan Sci Fi. Book is in good condition, all pages intact. Will and Evanlyn are captives of slavers, en route to a lifetime of dismal servitude in Skandia. Halt, expelled from the Rangers, now pursues the slaver ship in hope of rescuing them, but every bandit and warlord in Gallica stands in his way. 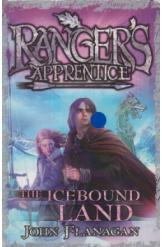 Book 3 of the Ranger's Apprentice series.